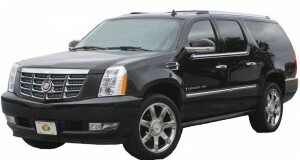 A-National Limousine utilizes the latest model Cadillac Escalades EXT. This vehicle, with its commanding presence and styling amenities, offers both versatility and luxury. The EXT is the ultimate luxury utility vehicle equipped with leather seating, touch-screen navigation, Bose surround sound, privacy tint, reading lights and rear climate controls. The Escalade accommodates up to 6 passengers with cargo space for 4-6 large bags.